Militarization, abuses of human rights, police repression to the protesting communities and massive contamination of heavy metals in the soil and in the bodies of peoples and animals. In the province of Espinar (Cuzco), where Glencore operates in the mining complexes of Tintaya (the mine is in the process of its closure), Antapaccay (which started its production in 2012) and Coroccohuayco (in exploration) , there have been complaints and lawsuits from the local communities regarding the pollution, which endangers their health and that of their animals . There are two central aspects in the actions of the Peruvian State and the mining company: violations of the human rights of the communities that live around the mining complexes and the environmental contamination generated in the area. 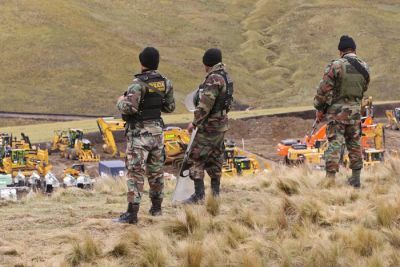 The case tackles both aspects, noting that the Peruvian government has taken position in the conflict in favor of the mining company, facilitating the presence of police forces to hold down the protestors and not recognizing the existing contamination. History of the conflict In Peru, the third producer of zinc and copper in the world , Glencore controls or participates in six mining mega-projects. In 2011, the Frente Único de Defensa de los Intereses de Espinar (FUDIE), together with the province’s major, filed a lawsuit against the company. They were based on two independent reports about the water in the area and the health of the population that confirmed, respectively, the contamination of the water with heavy metals and in harmful quantities for the body, as well as the presence of a highly dangerous concentration of arsenic, lead, chromium and mercury in the blood and urine of the inhabitants around the mining activities. The company denied the results of both reports as the conflict intensified in 2012, when the police repression to the protesting communities resulted in three deaths and dozens of injured. The land owned by the company was adapted as a camp for the detainees, who denounced abuses and torture . The policemen were not investigated but over 40 peasant leaders were sued, whose investigations still continue today. A year later, the Peruvian government published a new report that confirmed the contamination but that did not ultimately linked it to the presence of the mine . Glencore continued to defend that their activities did not harm the environment of the area. At the end of 2014, a doctor, co-researcher at the National Health Institute, revealed that a key piece of information had not been released to the public: the samples had shown the presence of eleven additional metals, among which was uranium . Although the company has not given a public statement in regard to this last evidence, it did spread a response to the report Conquistadores corporativos  in January, 2015, about the Espinar case. It continues to deny the contamination and blames it on the “mineralization of the area”, admits to having hired the police services for surveillance duties and highlights that their voluntary corporate social responsibility policies as exemplary. In conclusion, it considers the protests and critiques to their activities as unjustified . In the case, it was also denounced that Glencore has also signed an agreement with the Peruvian National Police (PNP) that included the lending of security and intelligence services to the company, as well as the existence of a police station inside the mining camp. The role of the Architecture of Impunity  In addition to having signed free trade agreements with the United States and the European Union, Peru participates in the negotiations of two of the most aggressive commercial agreements from the points of view of liberalization: the Trans-Pacific Partnership (TPP)  and the Trade in Services Agreement (TISA) . In essence, these accords already secure rather firmly the interests of foreign companies, without obligations for complying with human and environmental rights. Additionally, as most South American countries during the 1990s, in the middle of the neoliberal heyday and the privatization of strategic state companies, Peru signed up to 29 bilateral investment protection treaties (BITs) . Among these BITs were those with Glencore’s countries of origin: Switzerland and United Kingdom. As the great majority of the treaties of this kind, they only include the rights of the investors and not their responsibilities. The treaty signed with Switzerland states that in case a conflict arises between a company of one country and the government of another, first a dialogue should be opened between both governments. If there are no results, the case will go to a tribunal in the country were the investment is taking place. If the tribunal does not solve it within 18 months or if the company does not comply with the decision, it can directly proceed to an ad hoc arbitration tribunal as the International Centre for Settlement of Investment Disputes (ICSID) . In the case of the BIT with United Kingdom, the time limit is three months and it is possible to proceed directly to the arbitration method that the company prefers. The ICSID is not directly mentioned as it is possible to use other tribunals . Currently, the Peruvian government is already facing three important cases with mining companies at the CIADI: Bear Creek Mining Corporation (Canada), The Renco Group, Inc. (United States) y Compagnie Minière Internationale Or S.A. (France) . With a company such as Glencore, Peru is not only hampered by the BIT and the ISDS mechanisms, but also by their own commercial relationships. Being mainly an exporting country, the EU is their third main export market and represents the 16,4 % of the exports, and Switzerland their fourth, with a 7,2 % . Attempts of access to justice The company Glencore – Xstrata has been sued at a national and international level in the following bodies: At the environmental Attorney’s Office in Cuzco, for their crimes to the environment. However, according to the Peruvian Penal Code, in order to accredit responsibilities in terms of contamination, a previous permit from the pertinent state authority is necessary. In the case of Espinar, the State did not establish the cause for pollution. Thus, the Attorney will most likely file the case. Investigations of the death of the three local inhabitants during the conflict in May 2012 have been initiated, but the State has noted that it is not possible to identify the penal responsibility, and thus the case was provisionally filed. 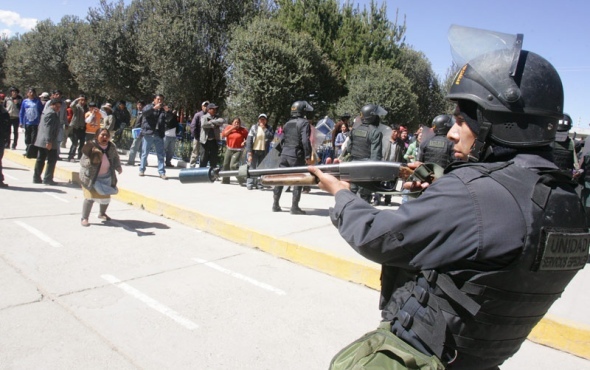 In July 2012, the President of Peru asserted that no more agreements within the Peruvian National Police (PNP) and the mining companies would be permitted, however this does not seem to be a reality just yet. Members of the Committee for the Defense of Health and the Environment in Espinar, as well as different organizations and affected communities by the Glencore project in the region presented in May, 2015, at the Juzgado Mixto de Espinar, an action suit (“Demanda de Acción de Cumplimiento”) for the government to establish public policies in favor of health and environment for the people affected by toxic heavy metals in the Tintaya-Antapaccay area. The European Center for Constitutional and Human Rights (ECCHR), the Swiss organization Multiwatch, Human Rights Without Frontiers and CooperAcción from Peru presented a legal report to the UN. These organization requested Léo Heller, the Special Rapporteur for the Human Right to Water and Sanitation, and to the Working Group on the issue of human rights and transnational corporations and other business enterprises, to determine whether the governments of Switzerland and Peru, as well as Glencore, complied with their duty to secure the human rights of the inhabitants of Espinar, especially those affected for the heavy metal pollution. At the international level, the families of the three dead peasants and those injured and arrested at the 2012 conflict have sued Glencore at their financial and administrative office at London (UK) for the crimes committed against them. The case is still being processed. What Justice could do: a say from the PPT In a hearing that was held in Geneva in June 2014, the Permanent People’s Tribunal (PPT) listened to the testimony of Jaime Cesar Borda Pari, from Coordinación de Muqui Sur. Considering the evidence brought before the judges by this witness, the Tribunal recognized the actions of the transnational corporation as another example of violations of human and people rights. In line with its full judgement of Madrid, in May 2010, and just a few months before the session that was held in Mexico in December 2014, the PPT underlined once again how transnational corporations, including Glencore, systematically violate human and peoples’ rights to their own profit. In the same line, the PPT recognized in this widespread practice the current shortcoming of international law, namely the impossibility of accessing justice and obtaining a remedy that is increasingly becoming an unbearable burden for affected communities, as well as for the laws that are supposed to give them shelter. In the same spirit, the PPT acknowledged the necessity to improve international legislation, including through a binding treaty on transnational corporations, and a Peoples’ treaty, in order to hold transnational corporations accountable for their actions. (En Español)Resumen del conflicto En la provincia de Espinar (Cusco), donde Glencore dispone de los complejos mineros de Tintaya (en fase de cierre de mina), Antapaccay (que inició la producción en 2012), y Coroccohuayco (en exploración) (1 - Cabe recordar que Tintaya es una mina a cielo abierto, en actividad desde 1985 y controlada por la Suiza Xstrata desde 2006 y posteriormente fusionada con Glencore. Al estar a punto de agotar sus reservas, se está ampliando el área de producción con los nuevos complejos de Antapaccay , situados en su proximidad) existen quejas y denuncias por parte de las comunidades locales por la contaminación, que pone en grave riesgo su salud y la de sus animales (2) . En el caso se destacan dos aspectos centrales en la actuación del Estado Peruano y la empresa minera: violaciones de derechos humanos a las comunidades del entorno minero y la contaminación ambiental generada en la zona minera anteriormente mencionada. La denuncia se sitúa en ambos ámbitos, apuntando que el gobierno peruano ha tomado posición en el conflicto, a favor de la empresa minera, que ha facilitado la presencia de efectivos policiales para reprimir a los manifestantes y que no reconoce la contaminación existente en la zona. Historia del conflicto En el Perú, el tercer productor mundial de zinc y de cobre (3), Glencore controla o participa en seis mega-complejos mineros. En 2011, el Frente Único de Defensa de los Intereses de Espinar (FUDIE), conjuntamente con el alcalde de la provincia, presentaron una denuncia contra la empresa. Se basaron para ello en dos estudios independientes sobre el agua y sobre la salud, que confirmaban, respectivamente, la contaminación del agua con metales pesados y en dosis dañinas para la salud, así como la presencia de una concentración altamente peligrosa de arsénico, plomo, cromo y mercurio en la sangre y la orina de sus habitantes del entorno del proyecto minero. La empresa desmintió los resultados de ambos estudios y el conflicto subió de tono en 2012, cuando la represión policial de las comunidades tuvo un saldo de tres muertos y decenas de heridos. El terreno de la empresa fue acondicionado entonces como un campamento para presos, quienes denunciaron maltratos y torturas (4). No se investigaron a los policías pero más de 40 dirigentes campesinos fueron denunciados judicialmente, cuyas investigaciones continúan a día de hoy. Un año después, el gobierno peruano realizó un nuevo informe que confirmaba la contaminación pero que no acababa de vincularla con la presencia de la mina (5). Glencore siguió manteniendo que su actividad no dañaba el medio ambiente en la zona. A finales de 2014, un médico co-investigador en el Instituto Nacional de Salud reveló que se había escondido a la población una información clave: las muestras habían indicado la presencia de once metales adicionales, entre los cuales figuraba el uranio (6). Si bien la empresa no se ha pronunciado sobre este último punto, difundió una respuesta al informe Conquistadores corporativos (7) en enero de 2015 sobre el caso de Espinar. Continúa negando la contaminación y la atribuye a la “mineralización natural de la zona”, admite haber contratado los servicios de la policía para tareas de vigilancia y resalta sus políticas voluntarias de responsabilidad social corporativa como ejemplares. En suma, considera las protestas y las críticas ante su actuación como injustificadas (8). En el caso se denunció también que Glencore había firmado un convenio con la Policía Nacional del Perú (PNP), que incluía la prestación de servicios de seguridad e inteligencia a la empresa, así como la existencia de una comisaria de la Policía en el interior del campamento minero. El papel de la Arquitectura de la Impunidad (9) Además de haber firmado tratados de libre comercio con los Estados Unidos y con la Unión Europea, el Perú participa en las negociaciones de dos de los acuerdos comerciales más agresivos desde el punto de vista de la liberalización: el Acuerdo Estratégico Transpacífico de Asociación Económica (TPP por sus siglas en inglés) (10) y el Acuerdo sobre el Comercio Internacional de Servicios (TISA) (11). En sí, dichos acuerdos ya blindan de forma relativamente sólida los intereses de las empresas extranjeras, sin obligarles a cambio a que respeten los derechos humanos o el medio ambiente. De forma adicional, como la mayoría de países sudamericanos durante los años 90, en pleno auge neoliberal y de privatización de las empresas estatales más estratégicas, el Perú firmó hasta 29 tratados bilaterales de protección de las inversiones (TBI) (12). Entre los TBI se incluyen aquellos con los países de “origen” de Glencore: Suiza y el Reino Unido. Como la gran mayoría de los tratados de este tipo, incluyen únicamente los derechos de los inversionistas y no las responsabilidades. El tratado firmado con Suiza estipula que en caso de conflicto entre una empresa de un país y el otro gobierno, primero se abre un diálogo entre ambos gobiernos. Si no tiene resultados, se acude a un tribunal nacional en el país donde tiene lugar la inversión. Si el tribunal no resuelve en el plazo de 18 meses o si la empresa no está de acuerdo con su decisión, puede acudir directamente ante un tribunal de arbitraje ad hoc conformado en el Centro Internacional de Arreglo de Diferencias Relativas a Inversiones (CIADI) (13). En el caso de TBI con el Reino Unido, el plazo son 3 meses y es posible acudir directamente al medio de arbitraje que escoja la empresa. No se menciona específicamente el CIADI porque se puede adoptar un tribunal ad hoc en otros marcos (14). Actualmente el Gobierno peruano ya se enfrenta a tres casos importantes con empresas mineras ante el CIADI: Bear Creek Mining Corporation (Canadá), The Renco Group, Inc. (Estados Unidos) y Compagnie Minière Internationale Or S.A. (Francia) (15). Frente a una empresa como Glencore, el Perú no solo está atado por TBI y el mecanismo de solución de las controversias, sino también por las propias relaciones comerciales. Siendo un país primario-exportador, los países de la Unión Europea son su tercer destino de exportación, y representan el 16,4 % de sus exportaciones, y Suiza el cuarto, con un 7,2 % (16). Intentos de acceso a la justicia La empresa Glencore – Xstrata ha sido denunciada a nivel nacional e internacional en las siguientes instancias: - Por delitos ambientales en la Fiscalía ambiental en Cuzco. Sin embargo según el Código Penal peruano, para acreditar responsabilidad en el tema de contaminación, previamente se exige que sea la autoridad estatal competente quien lo afirme. En el caso de Espinar, el Estado no estableció la causa de la contaminación. Frente a ello probablemente la Fiscalía archive el caso. - Se han iniciado investigaciones por la muerte de los pobladores durante el conflicto mayo del 2012, sin embargo el Estado ha señalado que no es posible identificar la responsabilidad penal, y se archivó provisionalmente el caso. - En julio del año 2012 el Presidente del Perú afirmó que ya no se permitirían más convenios entre la Policía Nacional del Perú (PNP) y las empresas mineras, sin embargo no consta que esto sea una realidad. - Miembros del Comité por la Defensa de la Salud y del Ambiente de Espinar, así como diferentes organizaciones y comunidades afectadas por el proyecto minero de Glencore en Espinar presentaron en mayo del 2015 en el Juzgado Mixto de Espinar una Demanda de Acción de Cumplimiento para que el Gobierno Central establezca políticas públicas en favor de la salud y el medio ambiente para las personas afectadas por metales pesados en su organismo en el área de influencia del proyecto minero de Tintaya - Antapaccay en Espinar. - El Centro Europeo por los Derechos Constitucionales y Humanos (ECCHR), la organización suiza Multiwatch, Derechos Humanos sin Fronteras y CooperAcción de Perú acudieron a las Naciones Unidas. Mediante la presentación de un informe legal, dichas organizaciones solicitaron a Léo Heller, Relator especial sobre el derecho humano al agua potable y el saneamiento, y al Grupo de trabajo sobre la cuestión de los derechos humanos y las empresas transnacionales y otras empresas, determinar si los gobiernos de Suiza y Perú, así como la empresa Glencore, cumplieron con su deber de respetar los derechos humanos de los ciudadanos de Espinar, sobre todo los afectados por metales pesados en la zona minera. - A nivel internacional: las víctimas de los heridos, familiares de los fallecidos y demás detenidos en el conflicto de mayo del 2012 han denunciado en su sede financiera administrativa de Londres (Reino Unido) a la empresa Glencore por los daños causados a estas personas. El caso aún está siendo procesado. Lo que la justicia podría hacer: una opinión del TPP En la sesión en Ginebra de junio, 2014, el Tribunal Permanente de los Pueblos (TPP) escuchó el testimonio de Jaime Cesar Borda Pari, de Coordinación de Muqui Sur. De acuerdo a lo expuesto ante los jueces del tribunal, éste reconoció las acciones de la corporación transnacional como otro ejemplo de violaciones de derechos humanos y de los pueblos. De acuerdo a la sentencia de Madrid, en mayo de 2010, y unos meses antes de la sesión que tuvo lugar en México en Diciembre 2014, el TPP resaltó de nuevo cómo las corporaciones transnacionales, incluida Glencore, violan sistemáticamente estos derechos para su propio beneficio. El tribunal reconoció en esta extendida práctica la evidente limitación del derecho internacional. La imposibilidad del acceso a la justicia y a obtener remediación está convirtiéndose en una carga cada vez mayor para las comunidades afectadas, así como las leyes que deberían protegerlas. Así mismo, el TPP reconoció la necesidad de mejorar la legislación internacional, incluyendo un tratado vinculante para las corporaciones transnacionales y un Tratado de los Pueblos, para que así estas empresas sean consecuentes con sus acciones. Project Details Tintaya is an open-pit mine, functioning since 1985 and controlled by Xstrata since 2006, who later merged with Glencore. Given that it is about to run out of reserves, the production area is growing with the new complexes of Coroccohuayco and Antapaccay, close to the original site. Antapaccay initiated its operation in November 2012. Currently, its production consists of 80,000 tons per day. Its reserves surpass the billion tons of 0.49 % copper with an estimated service life of two decades. Tintaya es una mina a cielo abierto, en actividad desde 1985 y controlada por Xstrata desde el 2006, quien posteriormente se fusionó con Glencore. Al estar a punto de agotar sus reservas, se está ampliando el área de producción con los nuevos complejos de Coroccohuayco y Antapaccay, situados en su proximidad. Antapaccay inició sus operaciones en noviembre del 2012. Actualmente su producción consiste en 80.000 toneladas por día. Tiene reservas que superan los 1.000 millones de toneladas de cobre con una ley de 0,49 % y una vida útil estimada de dos décadas. Why? Explain briefly. El nivel del conflicto en la zona muestra brotes de violencia cada cierto tiempo. No se ven muestras claras de favorecer las demandas de los afectados. Minería y conflicto social (De Echave, J, Díez, A. et al, Eds), IEP, pp. 255-147. Borda, J. (2013). Espinar y la minería: entre movilizaciones, proceso de diálogo y lecciones de resistencia social. En: Hoetmer, R., Castro, M., Daza, M., De Echave, J., y Ruiza, C. Minería y movimientos sociales en el Perú. Lima: PDTG, Cooperacción, Acsur las Segovias y Entrepueblos. New Internationalist - Who's the ugliest? Other Comments Impactos Especificos sobre Mujeres: Las afectaciones concretas a las mujeres por estas actividades extractivan radican principalmente a partir de los efectos nocivos en la salud, ya que además de presentar a las enfermedades, son las mujeres quienes tienen que hacerse cargo del cuidado de las familas. a. Doña Felícitas Quima, de la comunidad de Alto Huancané: «La salud en mi familia es que todos los señores que viven en esos sectores tienen infinidad de enfermedades, hay muchos que tienen dolor de pies, de cabeza, no pueden cocinarse, se le sacan sus cabellos, los niños cuando se bañan con esa agua empiezan granitos se les sale en su cuerpo. Es triste la realidad». b. Doña Santusa Ángela Nañahauca de Ccana, de la comunidad de Alto Huancané: «En mi comunidad, en mi sector, hay filtraciones. En donde yo vivo, al ladito de la relavera de Alto Huancané, la relavera de Cancha, y en ahí mis animales se han muerto, totalmente hemos sido pobres. Ya no hay oveja, ya no hay alpaca».